MacInTouch readers report that the Core 2 MacBooks and MacBook Pros are significantly more reliable than the original Core Duo models they replaced, and the Apple Blog suggests ten programs every 'Book user should know about. Security is another big issue this week, with security software, a hack that lets iSight equipped Macs take photos during failed logins, and a program that locks out your keyboard to keep others from using your Mac - or so you can clean the keys without worrying about erroneous keystrokes being recorded. "We would like to thank all the MacInTouch readers who participated in our second MacBook and MacBook Pro reliability survey this year, logging data on more than 3,700 laptops with thousands of comments. "This second survey covered all Apple's MacBook Pro and MacBook computers, including Apple's newest Core 2 laptops, as well as the original Core Duo designs. "Our initial survey of MacBooks and MacBook Pros in August of 2006 investigated a wide variety of problems reported by owners of these radically-redesigned Mac laptops. With Apple's switch to Intel processors and logic boards - and away from PowerPC processors and Apple chipsets - we saw a bewildering variety of issues. Our initial survey identified and quantified the most widespread problems. "In this follow-up survey, we wanted to see if the problems identified in our original survey have been addressed by Apple, as we compare them with the new Core 2 models." "The new Core 2-based models show a much lower level of repairs...."
"Top 10 lists have been blogged practically to death. But they're not dead yet. No sir! Perhaps, however, in an effort to push their foot an inch or two closer to the proverbial grave, I'd like to offer a top 10 list of my own. This one is for the laptop-toting Mac user who, because of their choice to wield a portable Mac, is forced to make certain sacrifices in usability, power, and efficiency." "It would not be too difficult to modify this tool to call home and even email photos should a laptop be stolen." PR: According to a recent survey commissioned by Kensington Computer Products Group, 65% of people plan to take their notebook computer with them on vacation this holiday season. Notebooks, a lifeline to work and entertainment, can be easily protected with common sense and some smart tips during what is often a hectic and fast-paced time of the year for many. A notebook computer is stolen every 53 seconds, and according to the FBI, 90% of stolen notebooks are never recovered. Symantec research suggests that an average notebook holds content valued at $972,000 and that some could carry as much as $8.8 million worth of commercially sensitive data and intellectual property. "People entrust their personal information, photos, music as well as sensitive corporate data in their notebook computers," said Roma Majumder, Kensington Senior Global Product Manager, Security. "Holiday travel presents a security challenge, because the more that people move their notebook around, the higher chances of it being stolen in transit." Never leave a laptop unattended in a public area or an office you are not familiar with. Always lock your laptop with a cable-locking system, such as the Kensington MicroSaver , to your desk or in a secure cupboard if left overnight or while in meetings. "No one wants to deal with a lost notebook, especially during the holidays," said Majumder. "You owe it to yourself to take preventative measures against theft so that your computer is there when you need it." With company milestones including the first notebook security cable lock and the patented Kensington Security Slot, built into 99% of all notebook computers - Kensington has a history of being first-to-market with security solutions that offer simple and effective ways for people to protect their electronic investments. The MicroSaver is the physical component of Kensington's complete security solution, which features data, access, and hardware protection. The latest keyed MicroSaver locks incorporate carbon-tempered steel cables and introduce robust multi-disc locking mechanisms to the world of notebook security. Lock tampering triggers security indicators and automatic lockdown systems built into each MicroSaver. Kensington offers both keyed and keyless systems with a range of products to suit different budgets and security needs. With over 15 years of experience and innovation in notebook protection solutions, Kensington is a proven leader in security. Through rigorous testing and constant improvement, Kensington develops products that help consumers meet the security challenges of tomorrow. The Kensington MicroSaver is the world's #1 laptop security lock and is backed by the Kensington Lifetime Warranty. "Orange has reached a deal with Apple under which customers will be able to rent a MacBook and use the telecom firm's broadband services for around just €2 per day. "The companies are aiming the service at young consumers who are considering whether they should invest in a MacBook, according to a French-language report in popular newspaper, Le Figaro." "A heatproof battery for laptops, which could help solve recent problems with overheating, is to be mass produced by Japanese firm Matsushita. "It follows a series of incidents where batteries overheated or caught fire. "Sony has had to recall millions of laptop batteries in the last year and Matsushita and Sanyo also have had problems with overheating. "Matsushita has added a heat resistant layer to its lithium ion batteries and plans to step up mass production." "Taiwan-based Career Technology has received certification from Apple Computer to supply flexible printed circuit boards (FPCBs) for MacBooks, according to the Chinese-language Commercial Times." "Now that it's got an Intel Core 2 Duo processor, the Apple MacBook is one of the best budget laptops around." "Hereafter are some photos of a MBP C2D 17" from an inside point of view. One can clearly see the 3 output antenna leaving the AirPort card, 2 of them going into the screen case, while the last one goes into the hinge. The RAM comes from Samsung." PR: Not Mac OS computers, but Panasonic's "ToughBook "rugged" PC laptops fill a niche Apple has never chosen to compete in. Some friends of min replaced their PC desktop with a toughbook, and say they really like it. Panasonic Computer Solutions Company and Sprint have announced that the business-rugged Toughbook W5 and T5 notebooks will now feature built-in support for Sprint Mobile Broadband services, including its upgraded EV-DO Revision A service where available. With this certification, Panasonic now offers the broadest range of Sprint-enabled reliable PCs for all mobile environments, from extreme to mainstream, including rugged, semi-rugged and business-rugged mobile computers. The ultraportable and reliable W5 and T5 join other 3G enabled Toughbooks, including the fully rugged CF-29 notebook, CF-18 convertible tablet and semi-rugged CF-74, as part of Panasonic's portfolio of mobile broadband enabled notebooks. With this certification, users will have the option to access Sprint Mobile Broadband service running on the Sprint Power Vision Network in more than 220 communities (with a population of more than 100,000) and 725 airports across the US, a coverage area that encompasses more than 180 million people. "Sprint and Panasonic have had a long-standing relationship based on the belief that the promise of seamless connectivity requires a notebook designed to stand up to the test of mobility," said Victoria Obenshain, director of wireless strategy, Panasonic Computer Solutions Company. "Lightweight, durable business-rugged notebooks - with exceptionally long battery life - are the perfect fit for today's mobile business user and complement our existing family of Sprint-enabled rugged and semi-rugged Toughbooks. Now, Toughbook users - from the extreme to the mainstream - can access Sprint's next generation mobile broadband service wherever their work takes them." "Combining the innovation and capabilities of the Sprint Power Vision Network with rugged and reliable Panasonic notebooks demonstrates an unmatched value for mobile users," said Danny Bowman, vice president of customer equipment for Sprint. "With the EV-DO Rev. A-equipped W5 and T5, Sprint and Toughbook customers have a complete solution that combines real-time, access on the go with a lightweight, reliable form factor so customers have the power to do more." Both the W5 and T5 Toughbooks feature the Wireless PCI Express Mini Card Embedded Module from Sierra Wireless, giving Toughbook customers a top-of-the-line wireless broadband computing experience. With this technology users can take advantage of Sprint's advanced mobile broadband services (EV-DO Rev. A), where available, to access the Internet or e-mail, download large files and attachments, and run hosted business applications. With Rev. A enhancements, users can anticipate average download speeds of 450 to 800 kbps and upload speeds of 300 to 400 kbps. The notebooks will also operate on the Sprint Power Vision Network where the EV-DO Revision A upgrade is not yet available. The ultraportable Panasonic Toughbook W5, with its integrated DVD/CD-RW combo drive, 12.1 inch antiglare LCD, and weight of just 3.1 pounds, is ideal for mobile professionals who demand the standard features found in larger notebooks at a decreased size and weight. The W5 also offers an exceptional battery life of eight hours. The Toughbook T5 is an ultraportable tablet alternative notebook with a 12.1 inch touchscreen display, 10 hour battery life, ergonomic hand strap, and weight of just 3.5 pounds. It is ideal for professionals who want the flexibility to enter information with a stylus or using the keyboard. The Panasonic Toughbook W5 and T5 with embedded Sprint Mobile Broadband will be available next month at an estimated street price of $2,249.00. These and other Toughbooks are available through authorized Panasonic Toughbook resellers, including Panasonic authorized Sprint Business Solutions partners, and, online, via "Buy Now" partners. The new fully rugged Toughbook is built to go wherever your job takes you. From the field to the plant to the station and back again, Toughbook takes the punishment, while its shock-mounted removable hard drive performs the most advanced applications flawlessly. The Toughbook 19 was designed using the military's MIL-STD-810 test procedures that measure equipment durability under harsh conditions - and it passed with flying colors. 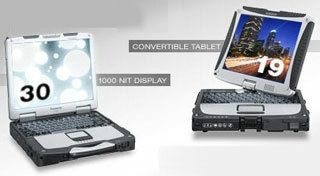 And the Toughbook 30 is the first notebook to deliver fixed mount screen brightness - 1000 Nit - in a portable computer, for unparalleled outdoor readability. Passed all MIL-STD-810F durability tests - drops, shaking, etc. PR: Just arrived! New RhinoSkin 13'' MacBook hard case just in time for the Holidays! 13'' black version and MacBook Pro cases coming soon! 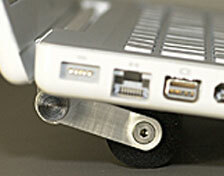 PR: QuickerTek Carry Handles for the latest Apple MacBooks are now shipping. MacBook Carry Handles are sturdy and provide an easy means of transporting your MacBook. MacBook Handles are available for $50 from QuickerTek and its dealers. And, orders from QuickerTek will be shipped free of charge until the end of December 2006. The QuickerTek Carry Handle line extends back several years and has always been the leader in handle design and appeal. Aluminum construction is strong, light weight and assists in dissipating heat. The patent-pending design allows for more possible angles, improving desktop ergonomics. 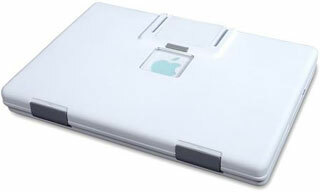 The handle padding also prevents scratches to the MacBook case and when used on a desk. The padding also prevents the MacBook from sliding around on a desk surface. Slot mounting holes ensures a snag-free installation. Like most QuickerTek products, Carry Handles are backed with a one-year warranty on parts and labor. PR: Griffin Technology Inc., creator of accessories for Mac, PC and iPod, has announced a versatile multimedia card reader for notebooks. Cards for your digital still camera . . . cards for your digital camcorder . . . flash memory cards for file portability.... With the plethora of memory card formats in use today, you need a card reader that's not only fast and portable, but versatile, as well. Griffin's 5-in-1 works with the ExpressCard/34 or /54 slot found in Apple's MacBook Pro and many recent Windows laptops. It's not only versatile, but also the fastest way to transfer data from your memory cards, comparable to or better than USB 2.0 High-Speed (up to 480 Mbps). Contrast this with the 12 Mbps you get from USB 1.1 card readers - and even slower rates when transferring directly from the camera. Griffin's 5-in-1 works with both Mac OS and Windows XP right out of the box. It's truly plug & play, no drivers or installation software required. No batteries required, either; it gets its juice directly from your computer's ExpressCard slot. Lightweight, compact, and durable, ExpressCard 5-in-1 is easy to travel with, and a great companion for any MacBook Pro. Griffin ExpressCard 5-in-1 Card Reader/Writer, priced at $29.99, is available now at www.griffintechnology.com, and at many third-party resellers. PR: Keyboard Cleaner comes in handy when you want to clean your keyboard, but you are afraid you might trigger a command or change or delete some of your current work beyond repair and undo. Of course you could save and close everything. Sometimes however, it is just not what you want. Enter Keyboard Cleaner. It shields your desktop and intercepts every keystroke you might accidentally make - except for Command-Q. Especially useful with laptop Macs, or if you have a cat that wanders across the keyboard from time to time. Keyboard Cleaner was built with cat-friendlyness in mind. PR: LockOut can call your cell phone if someone attempts to break into your Mac. That's right! LockOut can optionally send an email to two separate email accounts whenever there's a break-in attempt. And if your cell phone has email text messaging, the email message can go directly to your cell phone. Resistant to system commands such as force-quit and command-tab. Once LockOut is in secure mode, there is no way to force-quit it or switch to another application. Your Mac is secure from intruders until the correct password is entered. People can leave messages for you. When used with Apple's Open Firmware Password application, no one can reboot from another volume without first entering your password. Completely rewritten in Cocoa for OS X 10.4 and above. The British Broadcasting Corporation, Dow Jones, the Gap, and many other corporations use LockOut to help secure their Macs. You can too. Launch LockOut at system startup. Choose between any system sound or a synthesized voice when someone enters a wrong password. PR: nova media has introduced support for the latest PC datacard AC 875 by Sierra Wireless in launch2net version 1.5.1. A type II PC Card with a fixed antenna, the AirCard 875 supports data rates up to 3.6 Mbps on HSDPA networks. AC 875 provides high-speed worldwide roaming with tri-band HSDPA/UMTS and quad-band Class 12 EDGE/GPRS connectivity. launch2net is a mobile connection manager for Mac OS X which supports more then 150 devices and already includes more than 300 network settings to connect nearly anytime, anywhere to mobile networks around the globe. "Finally most PowerBooks have a truly international solution for high-speed mobile Internet access", states Jan Fuellemann, PR spokesperson at nova media. "System requirements are an internal Type II PC card slot and Mac OS X 10.3.9, 10.4.3 or higher." launch2net version 1.5.1 is available for download at nova media's website. A demo version is provided as well. For more deals on current or recently discontinued models, see our MacBook deals, 15" MacBook Pro deals, 17" MacBook Pro deals, 12" PowerBook G4 deals, 15" and 17" PowerBook G4 deals, titanium PowerBook G4 deals, iBook G4 deals, PowerBook G3 deals, and white iBook G3/deals.